YOU are the key to our success. Our mission is to transform lives through visionary support, advocacy, research and education of fibromyalgia and chronic pain illnesses. This year YOU made it possible. All of us at NFMCPA are truly aware that our supporters are key to every success we have. As part of our thanks, we'll recap NFMCPA community events in 2016: Information, webinars, national and local advocacy, awareness events and surveys relevant to improving your quality of life. We invite you to connect with 14 days of NFMCPA highlights in giving on Facebook and join us on November 29th for #GivingTuesday to show your support! We’ve made a goal to raise $5,000 on #GivingTuesday on November 29th to support upcoming projects and invite you to GIVE BACK today! You are the key. #GivingTuesday is the “Black Friday” or “Cyber Monday” for nonprofits. On the first Tuesday after Thanksgiving people world-wide can show their generosity and donate to their favorite cause. #GivingTuesday is more than just another nonprofit fundraising day – it is a call to action; a movement to help support causes near and dear to people’s hearts! Fibromyalgia and chronic pain are far behind other causes in raising funds to support research, education and advocacy. Here is your chance to make a personal difference in the lives of those with fibromyalgia and chronic pain. We hope your celebration and support of the work of nonprofit organizations will be fun, imaginative, and inspire you to join with us and reach out to your friends and family. The National Fibromyalgia & Chronic Pain Association (NFMCPA) is a 501(c)3 not for profit, charitable organization. We support people with chronic pain illnesses and their families and friends by contributing to caring, professional, and community relationships. Through continuing education, networking with support groups and advocates, and affiliation with professional organizations, the members of the NFMCPA have a place to be informed, get involved, and recognize achievements. Donations to the NFMCPA are tax deductible. Vision Statement: End chronic pain conditions from derailing lives by promoting early diagnosis, driving scientific research for a cure, and facilitating translational research for chronic pain's THREE A's of Treatment: Appropriate, Accessible, and Affordable. Your support helps us continue this important work. For #GivingTuesday on November 29th, you can make a difference for the chronic pain community by donating to the National Fibromyalgia & Chronic Pain Association to support further research, education and advocacy efforts. Help us reach $5,000 before the end of the year! Click the "Donate Now" button below to learn more about your donation options. 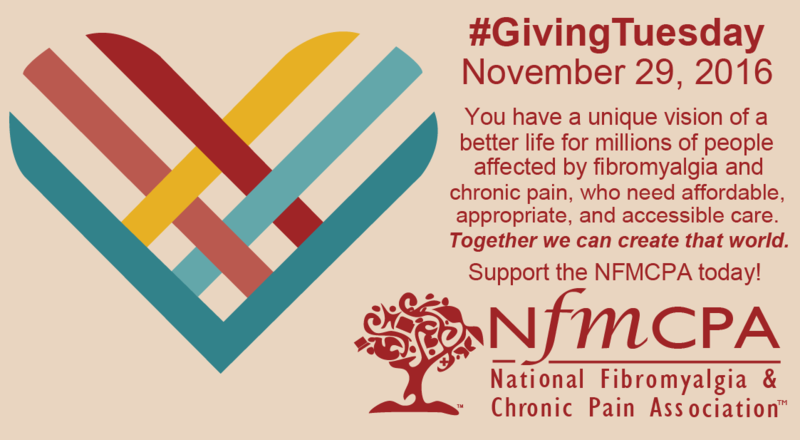 This year on November 29, I am participating in #GivingTuesday with the National Fibromyalgia & Chronic Pain Association (NFMCPA). #GivingTuesday is the “Black Friday” or “Cyber Monday” for nonprofits. On the first Tuesday after Thanksgiving people world-wide can show their generosity and donate to their favorite cause. Fibromyalgia and chronic pain are far behind other causes in raising funds to support research, education and advocacy. Here is your chance to make a personal difference in the lives of those with fibromyalgia and chronic pain. It's not everyday that the world stops to celebrate and support nonprofit organizations. Your donation will directly impact 100 million Americans who suffer from chronic pain and move us closer to a world more accepting of fibromyalgia and other chronic pain conditions. 100% of funds raised by the NFMCPA will benefit the fibromyalgia and chronic pain community. Donations are tax deductible. I appreciate your generosity in taking the time to read this email. "You can play a key role..."
"Please join us in our important advocacy efforts." "a winning combination of your help and a good cause..."
"One thing is for sure, together we make a difference." "Think how much we stand to gain--and how little it costs you." "There is simply no substitute for personal connections." "If we don't act now to unite our voices, who will?" "You can help us make the difference." Make your personal donation (any amount you’re comfortable with) and ask potential donors to match it. Why this works: People are encouraged to donate because you have committed to donating and it is you who is making a personal request. So, if you’re thinking, “Maybe I should,” please do! You’ll be pleasantly surprised by the results.